Kitchen and Residential Design: Ready to renovate? Take a moment and breathe first. 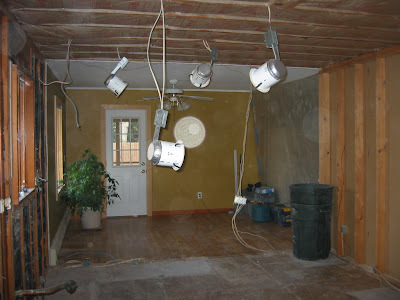 Ready to renovate? Take a moment and breathe first. I got a series of panicky phone calls yesterday from an otherwise rational client who was having her back splash tile installed yesterday. Back splash tile is usually the last element that gets done in a kitchen renovation and this client was in the final week of her six week construction project and she must have reached the point where she couldn't handle it any more. The material being installed was a glass tile we'd spent weeks selecting back in June. In fact, it was the first thing she picked in that whole process and it remained a constant through the whole selections phase of her project. Back in June, she was in love with that tile. I dropped what I was doing and ran up to her job site to see what could be done. I'd sold her the tile and I wasn't going to take a return so what there was to do was calm her down. Over the years, I've found that the best way to counteract panic is to get even more measured and calm than I am usually. Inside, there was a knot in my stomach but I was determined to come across like the Dalai Lama if it killed me. It took about an hour to talk her down from the ledge and let the tile setter finish his job. Her chief complaint was that the tile looked somehow different going in than it did in the mocked up sample I'd made over the summer. It took a little digging, but eventually I figured out that her tile looked different because it hadn't been grouted yet. My mocked up board was fully grouted and what she fell in love with was the finished tile. It never occurred to her that ungrouted tile would look so different from the finished product and I had seriously underestimated her inability to see the finished project as it would be rather than what it looked like when it was going in. I have the vision thing, all of us do who are involved in any kind of work that involves designing how something will look eventually. Most people don't have the vision thing and that's OK. I strongly suspect that the vision thing is an aptitude --it's something you're born with. I go overboard accommodating my clients' inability to visualize their finished projects but in this case, I now know that I hadn't gone far enough. But when I look back and remember that this tile panic was coming on the heels of a lighting panic, a granite panic, a cabinet color panic, a hardware finish panic and a flooring panic I realize that the only way I could have gone further overboard would have been to put her on an airplane and sent her away for two months. I've spent a lot of time being the Dalai Lama since construction started on this one six weeks ago. It happens sometimes. So the lesson here is to do a better job of identifying the people who need extra reassurance before they actually need that reassurance. If you're considering a renovation, keep a couple of things in mind. Now that I'm thinking about it, here's a list. Print this out and tape it to your fridge. 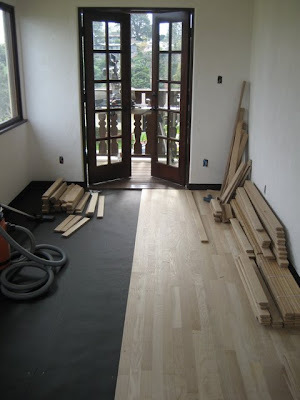 Any renovation job will cost more and take longer than you think it will. 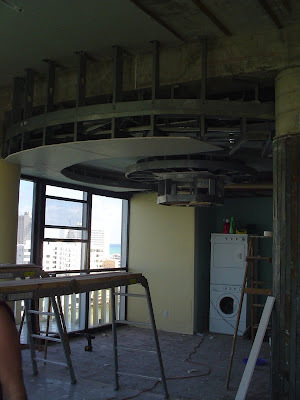 Don't start spending money until you have accurate estimates of the costs of everything associated with your job and the time frames it will take for all of your components to arrive and be installed. When you're getting prices and someone gives you a range rather than a set price (this happens a lot with labor costs and it's perfectly normal), use the high price in the range in your budget. That way, if the total comes in lower than the high price, you get a happy surprise instead of a miserable one. When someone gives you a delivery window or range (this happens a lot with lighting in particular and again, it's perfectly normal) use the further away date. So when you hear "four to six weeks" don't get attached to four weeks. Assume it will be six. Again, set yourself up to be pleasantly surprised rather than disappointed. When you're getting ready for construction to begin, make a "safe place" somewhere in your house. If it's a kitchen renovation you're about to embark on, set up a temporary kitchen somewhere. Move a microwave, dishes, food, a coffee maker, etc., somewhere near a utility sink or into a bathroom so you can have everything in one place when you go to make something to eat or start your day. Leave your bedrooms clear and uncluttered, don't use them for storage when you empty out the rooms being renovated. Keep your bedroom that way it is normally. After a couple of weeks of camping out in a bathroom and dealing with noise and dust, it's tremendously helpful to be able to go into your bedroom, close the door and retreat into normal. Don't hover over the people who are working in your home. If you're working with a designer and a contractor you trust, let the people who work for them do their jobs. Don't judge partially installed work unless you have the vision thing. In mid installation, nothing looks the way it will when it's done. Tile looks very different before it's grouted, kitchen cabinets look awful before they have counters on them, appliances are enormous when they aren't in position and dings and nicks in the walls get fixed at the end of a project. If you find yourself feeling overwhelmed, that's normal too. Take a walk, get out of the house, breathe, call your designer. Don't panic. Ever. There's always a solution and just as there's always a solution, the only way you can find it is with a clear head. You will spend a lot of money and be seriously inconvenienced but it will be worth it in the end. Anticipate in advance how you deal with messes and disruption and take steps ahead of time to prepare yourself, physically and emotionally. Finally, your memory of your renovation will always be less traumatic than your experience of it. Count on it. But it was worth it in the end, right? But the shower in your husband's office building basement sounds pretty inconvenient, I have to say. I'm confident your kitchen will turn out great too. I'm looking forward to reading the whole story on Design Ties. With a few minor adjustments, your list could be become a simple guide to a stress free life. I love the last one: Your memory of the event will always be less traumatic than the actual experience of it. Great advice. Thanks David. I used to tell people, "Your memory of this will be less traumatic than your experience of it, like labor." Too many people had a bad reaction to my likening renovation trauma to childbirth so I dropped that from my spiel. Hah! Hah! I was reading this and thinking, sounds a lot like giving birth. This is a primer to anyone considering a remodel. Remodeling hits all the hot buttons for people. It can be an emotional roller coaster for even the most rational and level headed people. It is an emotional minefield and out of all the underestimating that goes on prior to a reno, I think underestimating the emotional toll is the most widespread. It's important to keep your eyes on the end product. But knowing that and living that are two different things entirely. At least the renovation was part of a plan. One time we ended up renovating because a toilet decided to overflow randomly one night, spilling blackwater all over and we found out after 7 hours. Since it got down into some of our wood framing, we ended up tearing up about a 1/4 of our house. 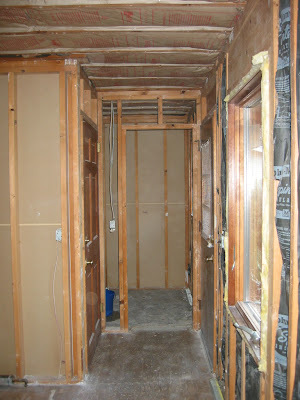 While looking at what it'd take to repair, we decided to renovate that bathroom, the kitchen underneath it, and the living room beside the kitchen as well. I wish I had pics of everything still. Thanks for your comment, that does not sound like a very fun way to embark on a project. How long did it take to complete your repair and reno? Great tips Paul! From my own personal experience found organization is the key. Did it about thirty some years ago (first home). The Contractor cudn't believe how calm, cool and collective I was. Four small children and it was the Christmas Season when we had walls coming down around us.....yet Santa still came. Just take time beforehand to prepare yourself for the disruption of your routine and be patient. You can't anticipate everything, but how you handle adversity is entirely determined by you. My entire existence is based on that little gem o' wisdom.